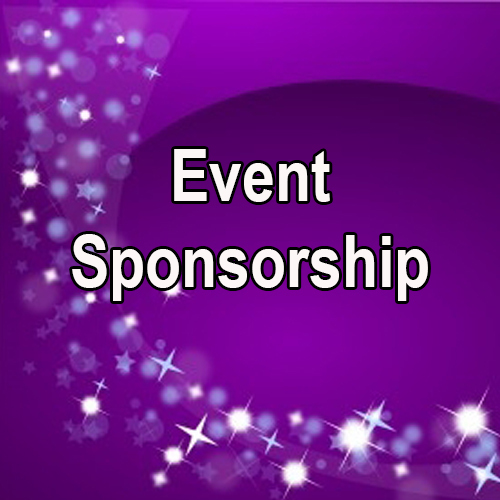 Securing sponsors for an event can be complicated — especially with shrinking marketing budgets and heightened competition. One of the biggest mistakes you can make is being focused on that one “perfect” sponsor for your event. If you run a large, established, and well-respected event, you might be able to start getting a little choosier about working only with your dream sponsors. But if you’re just starting out and looking for sponsors to make your event viable, then you shouldn’t be too picky. Wherever possible, be direct. Yes, you are looking for ‘partners’ to help make your event a success, but you are also looking for financial support. Try to make that clear as early as possible. Confusing brands and setting out expectations that no sponsorship fee will be involved isn’t a good strategy, particularly if you’re on a deadline and don’t have months to develop a relationship. Remember this: “no” is the second best answer after “yes.” What you want to avoid is a long, drawn-out process where a potential sponsor never commits. This ultimately wastes your time, because the longer it goes on for, the less likely it is to close. This is especially true if you’re talking relatively small money. Of course, if you’re asking for six or seven figures then negotiations are likely to take longer. But if your ask is relatively small, they’ll likely know if they can (and will) sponsor or not pretty quickly. So push for a “no” if you can’t get a “yes,” don’t take it personally, and move on until you get the answer you’re looking for. Sponsorship is a numbers game. Another common mistake with pitching sponsorships is that organizers treat them, and present them, as commodities. Sponsorships shouldn’t be sold like fast food, asking potential sponsors to pick off a pre-set menu. Instead, you should think about each sponsorship as a custom, specially tailored chance for a brand to enjoy high-engagement, long-form interaction with pre-qualified prospects. As such, don’t send a pre-written sponsorship rate card to potential sponsors; this will earn you a lot more “nos” than necessary. Instead, once a potential sponsor has shown interest in your event, insist on having a call with them to understand their objectives. Establish what it is they want from the event, what kind of deal size they would get from winning customers there, and try to gain insight into their budget and decision-making process. Once you’re armed with this information, you can write a completely bespoke proposal for them. This type of proposal makes you look more professional — and gives them something they’re much more likely to say “yes” to. During that initial conversion, try to establish if their interest in sponsoring is being driven by ego or ROI. Some companies will sponsor an event — oftentimes a sporting or cultural event — just because they want their name associated with it. This type of sponsorship is a way of showing the world that their company is doing well. It’s primarily driven by ego, with less of a focus on ROI. When negotiating a sponsorship driven by ego, you should focus on imagery: how their brand will look at and around the event; how often it will be seen and heard, and how being associated with your event will elevate them in the eyes of their peers (and potential customers). To help close these deals faster, play on scarcity, and the fact their closest competitors are also interested. But more and more, sponsorship decisions are driven by ROI — and determined by the budget holder’s ability to prove the economic value of that sponsorship to their boss. When negotiating a more ROI-driven sponsorship, you’ll want to focus more on metrics, how you’ll help them measure their return, and what you’ll do to help them achieve their goals. To help close these deals faster, explain that the value of their sponsorship compounds over time — so the earlier they commit, the better the ROI they’ll enjoy. It’s important to remember that sponsors want to convey a message. Find out what it is, and how you can help them tell it without being disruptive to the attendee experience. If a sponsor can’t quickly explain what message they want to convey, this should set off alarm bells. If they have nothing to say, it’s unlikely they’re going to pay you for the privilege of not saying it! Sponsorships are often easier to clinch with companies that have recently rebranded, launched a new product, got new senior leadership, or have some other significant shift in brand/strategy they want to show to the world. Once you understand what it is they want to tell the world, shape your sponsorship proposal around that core message, and how it will be articulated to your audience. Too often, organizers take a short-term view of their events. But if you’re in it for the long-haul, and plan on running your event again in the future, then it’s worth keeping all of your potential sponsors engaged — even if they said “no” to you this time. In fact, you shouldn’t just forget about them until you’re planning your next event. You should actively encourage them to attend your upcoming event, and wow them with what a great job you’ve done. There’s no better proof that you can deliver on your promises (and that they’re missing out) than by having them there to witness it. Of course, you don’t want them to think they can attend all of your events for free and reap the benefits; But as a one-time offer, it could be the key to sealing a deal for your next event. Why NAARI Exhibition ?NAARI represents the power of real Indian women. Never the less she represents the all rounder quality in her. 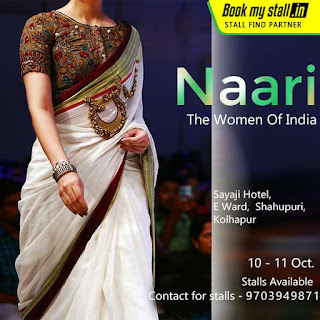 We present you ' NAARI- The Women of India' with great opportunity before Diwali. where one could buy wedding dresses, footwear, home decor, bed linen, sarees, accessories and bridal & Ethnic, WearHome Furnishing Cosmetics & BeautyHandmade Products, Jewellery, Women's Wear, HandicraftsHome, WearFashion Accessories Men's Wear. Celebrating the biggest and the largest Diwali, Durga Puja ...! 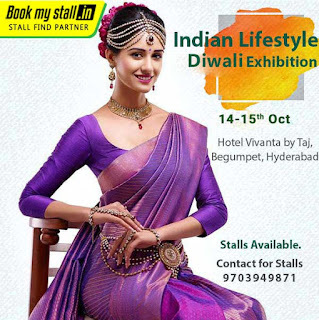 On 14th - 15th Oct 2017 Indian Lifestyle Diwali Exhibition Hyderabad. Diwali Exhibition runs for several months, even after Diwali is long over. Featuring shopping, food stalls, entertainment, Fashion Accessories, Kids Wear, Electronic Gadgets, Home Decor, Kitchenware, HandicraftsWomen's, WearJewelleryHandmade ProductsCosmetics & BeautyStartupsHome FurnishingBridal & Ethnic Wear games etc, Dasara exhibition ground is a good way to spend a Day & evening. 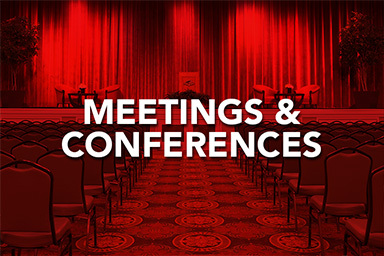 It is important to design conferences and learning programs with the recognition that participants may be in various phases of their careers and lives. An emerging professional is not going to have the same needs as someone who is nearing retirement. Employees with young children won't have the same priorities as empty nesters. The fastest way to alienate any audience is to deliver generic content that is not customized or relevant to their needs. Here are 6 strategies for designing more relevant multi-generational meetings.